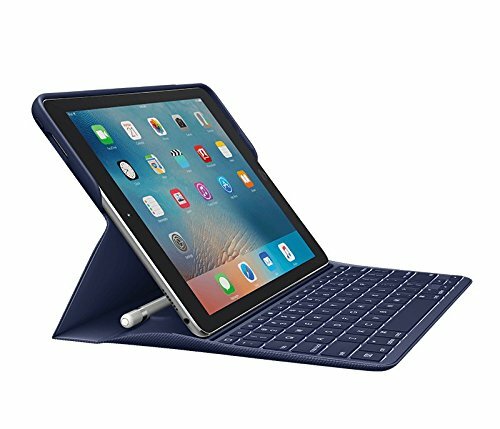 Product description Color: Blue Logitech Create: Backlit Wireless Keyboard with Smart Connector For iPad Pro 9.7" (Plum) Logitech Create (Plum) is a Backlit Keyboard Case for iPad Pro 9.7". Create connects to iPad Pro 9.7" via Apple Smart Connector, so it does not require Bluetooth pairing or charging. Create features a keyboard with well-spaced backlit keys and a dedicated row of iOS shortcuts that make typing a pleasure. Type on your tablet with this Logitech Create Backlit keyboard case for iPad Pro 9.7" (Plum), which eliminates the need for Bluetooth compatibility. Because it's designed specifically for iPad Pro tablets, this case pairs instantly from the moment you set your tablet in typing position. The backlit keys on this Logitech CREATE backlit keyboard case make typing in any lighting condition easy. Compatible with Apple iPad Pro 9.7" Only For a precise fit. Backlit keyboard Adjustable backlighting with automatic on/off. Offers high visibility. Connects to your device via Smart Connector So it never needs Bluetooth pairing or charging. Apple iOS shortcut keys Place convenient control of your device at your fingertips. 2 viewing angles Let you make the most of your iPad display, whether gaming, typing or browsing.